This display board is a piece of galvanized steel attractively framed in a matte black metal frame. 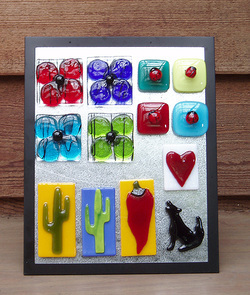 It's the perfect way to display our magnet collection on a countertop or table. Display is sold separately (no magnets included). Talk to our wholesale representative about available o﻿ptions. gift shops, museum stores and more across the United States.